MH370: What if it were to happen in the Arctic? What if an aviation disaster occurred in the Arctic or sub-Arctic? 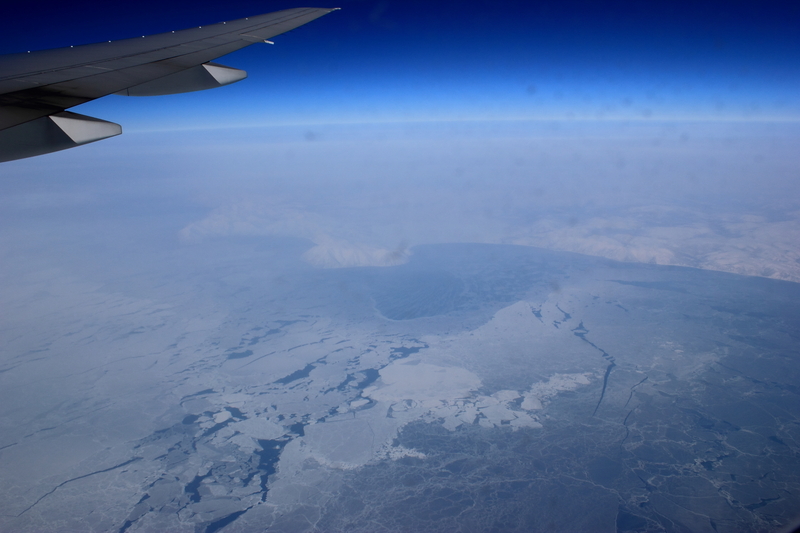 Pictured: Flying above the Sea of Okhotsk en route from Newark to Narita. © Mia Bennett, March 2012. What if an airplane were to encounter an emergency in similar conditions in the northern hemisphere in remote Arctic or sub-Arctic waters? While the chances are slim, there are a surprising number of airplanes flying over the Arctic. Cross-polar flights took off in 2000 as a shortcut between North America, Asia, and Europe. Flights between North America and the Middle East via the Arctic are booming as well, especially as Emirates tries to turn Dubai into a major hub. They offer reductions of up to 1,000 miles, saving fuel and a potential 85 minutes off travel time from North America to Asia. Return flights across the Pacific often fly at more southern latitudes to catch the prevailing winds. 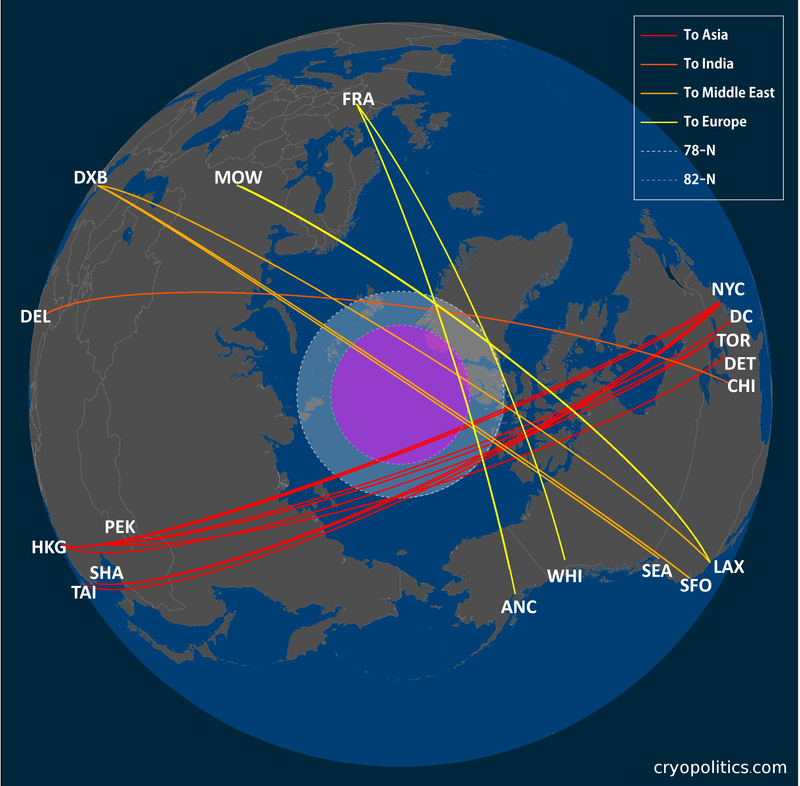 Whereas the Northern Sea Route and Northwest Passage offer to more quickly link Asian, North American, and European markets by sea, cross-polar flights do the same in the sky. Climate change is not responsible for the re-opening of these routes, which actually first began in 1954 with Scandinavian Airlines’ DC-6B service from Copenhagen to Los Angeles via Sondre Stromfjord, Greenland. Instead, impetus lies with the opening of Russian airspace after the dissolution of the USSR, growing economic activity between Asia, Europe, and North America, and improved aircraft technologies. Using data from OpenFlights, I made two maps. The first shows all of the regularly scheduled flights that cross north of the Arctic Circle (Figure 1). (NB: The flights are mapped using great circle distances rather than the actual flight routes taken, which follow specific waypoints in the sky rather than the shortest route from point to point.) Along an arc stretching from Tromsø, Norway to Norilsk, Russia, the European Arctic is the busiest for flights, reflecting the greater population density in this part of the circumpolar region. Alaska and Northern Canada also have regularly scheduled flights that are needed more due to the lack of roads and railroads in this part of the world than a dense population. More people live in Norilsk (population 175,365) than all of Northern Canada, for instance. 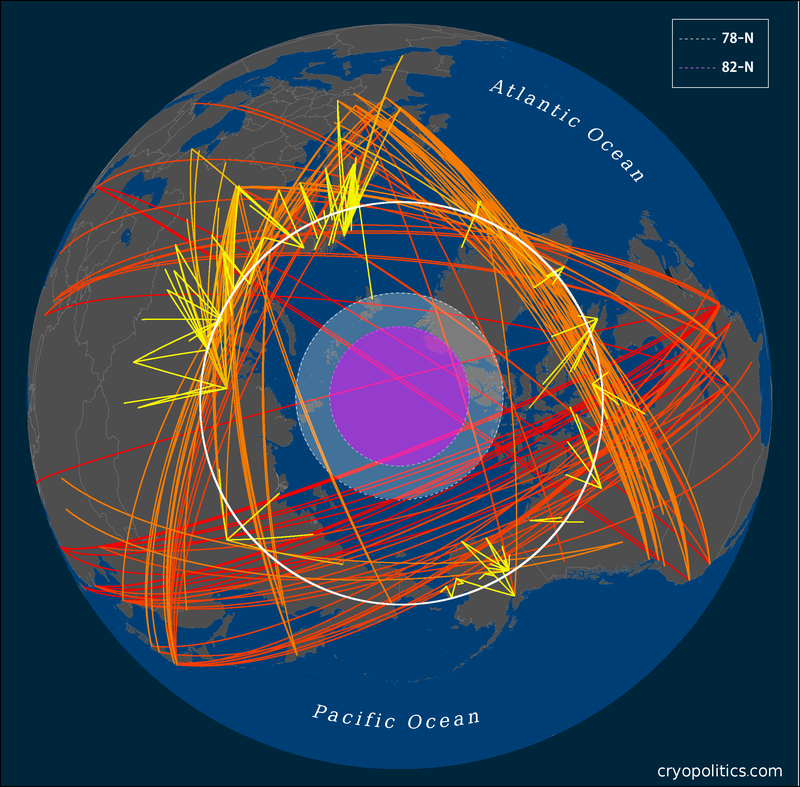 Figure 1: Flights crossing the Arctic Circle. Flights crossing the Arctic Circle aren’t technically “cross-polar” flights, however. The U.S. Federal Aviation Authority (FAA) only classifies flights as such if they enter into airspace north of 78°N. The second map (Figure 2) thus shows the flights that actually do enter into this northernmost airspace. (Of course, one lesson to be learned from MH370 is that a flight originating near the equator can end up at another end of the earth.) Due to the risks of severe weather, cold temperatures, and extremely remote conditions, these are the flights that run the risk of requiring major search and rescue operations in an emergency. Furthermore, north of 82°N, since satellite communication is often no longer available, pilots must rely on high-frequency radio, which solar radiation storms can disrupt. 2000, the first year of regular cross-polar flights, saw 402 planes cross the 78th parallel. In 2012, that figure exploded to 11,214 flights. The Boeing 777, one of the airplanes typically flying across the Arctic, seats a minimum of 314 passengers. If we take a rough estimate of 300 passengers and crew per plane (assuming not every flight is sold out), based on rough calculations, that means 3,364,200 people were above the Arctic last year. That number is almost equivalent to the region’s entire population, which is approximately 4 million. It’s amazing to think that today, for people not living there, the main way of experiencing the Arctic is by looking out an airplane window. Far more people fly above the Arctic than sail on Arctic cruises, for instance. Ironically, the only time these air passengers ever come into contact with the people living in the Arctic is during an emergency, when they have to make an unexpected landing. While rare, emergencies can and do happen: in 2002, SAS Flight 937 from Copenhagen to Seattle had to make an emergency landing in Kangerlussuaq, Greenland due to a bomb threat. While the threat was being investigated, SAS provided passengers with a free tour of the ice cap and a visit to the local gift shop . This instance was the most ideal form of a diversion, in which passengers actually had an opportunity to appreciate the Arctic landscape. Still, the fact that the flight had to make an emergency landing demonstrates the need for increased readiness for polar air contingencies. Though the risk of an aviation disaster involving a jumbo jet is lower than that of, say, a maritime disaster, polar aviation search and rescue planning is still fairly comprehensive. Much of it is publicly available, too, as with this Air Traffic Management Operational Contingency Plan for the Arctic Area. The Arctic Council’s landmark Search and Rescue Treaty, signed by the body’s eight permanent members in 2011, touches upon aviation, but the International Civil Aviation Organization (ICAO) handles the bulk of coordination and regulation. In any situation, polar or not, if an aviation disaster occurs in international waters, the country in which the aircraft is registered conducts the investigation. If it occurs within territorial waters, then the country in which the incident occurs bears the responsibility to investigate. In 1998, ICAO established the Informal Trans-Asia/Trans-Siberia/Cross Polar Routes High Level Steering Group to “coordinate the requirements of international civil aviation for safe, economic and operationally sound polar air routes operations” . Representatives from Canada, China, Finland, Germany, Iceland, Mongolia, Norway, Russia, and the U.S. participated in the steering group, as cross-polar flights regularly transit these countries’ airspaces. Now, most issues pertaining to cross-polar flights are handled by ICAO’s Cross Polar Trans East Air Traffic Management Providers’ Working Group. Thus, whereas Arctic shipping is still taking place without a mandatory polar code in place, Arctic aviation does not have such a gray regulatory regime. Trans-polar aviation has had to follow strict regulations since its inception at the end of the 1990s. For instance, flight information regions, which provide flight information and alerting services, are for the most part clearly delineated in the Arctic. The general public probably knows a lot more about FIRs after MH370, as the plane disappeared during the handoff from Malaysian to Vietnamese airspace. In the Arctic, FIRs are delineated as pictured in the map below (Figure 3). They do not always correspond to territorial airspace, as is the case with Iceland managing the Oceanic Controlled Airspace (OCA) over Greenland. Relatedly, I’m not sure if the “FIR Unknown” area has now been settled due to the resolution of the boundary conflict between Norway and Russia in 2011. Figure 3. Arctic FIRs. From the U.S. FAA. In this series, I’ll look more into cross-polar aviation and the current state of search and rescue capabilities. While the chances of an accident occurring are very slim, the plight of MH370 and millions of dollars being spent to find the aircraft – and hopefully learn from the incident – reveals that countries and corporations alike are willing to invest significant resources to make aviation even safer. As air traffic between North America and Asia is forecast to double by 2025 , ensuring that there are adequate search and rescue measures in the North Polar region is in both the public and private interest.